"You’ve probably already noticed our fresh cover look, but in fact, the entire magazine has undergone a redesign. 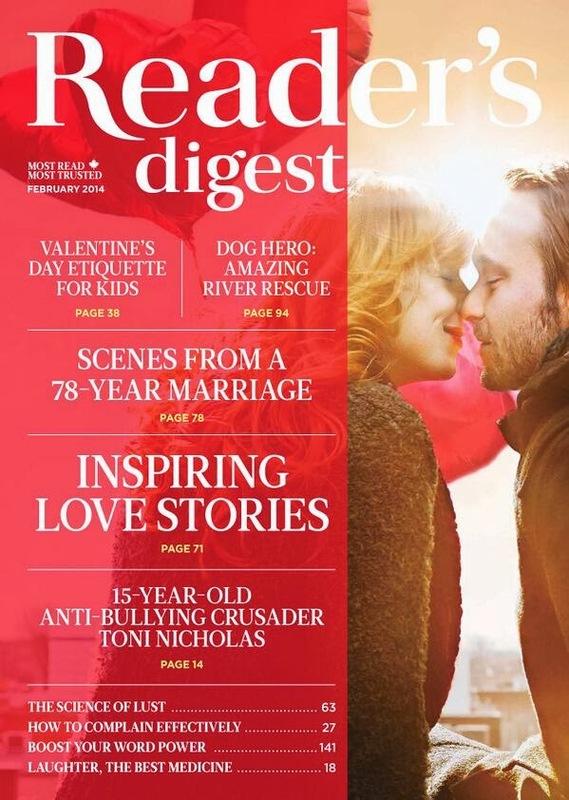 We asked what you liked best about Reader’s Digest and we’re happy to unveil a makeover to enhance your reading experience. From a new logo that emphasizes the “Reader” to an expanded selection of stories, this redesign is tailored to the people who told us they love our content and want more of it. We’re bringing you more tales to make you laugh or cry, more deep reads that motivate you to think and take action, more fun and more inspiration. And to make the type easier to read and the pages easier to turn, we’ve picked a white, thicker paper." Among other things, rather than cluster together all the jokes and humour for which the magazine is well-known, these have now, again, been spread throughout the issue. Saw the new issue on the newsstand. A great example of a redesign where the finished new product looks like the old. Most difficult to be creative with a small format magazine. Sadly, they seem to have cut their cartoons altogether, meaning that there are now no major markets remaining for Canadian cartoonists. Is this a redesign or an ominous, cost-saving measure? Very disappointing.